Rome is a handful because it's such a massive city, but it's definitely a must-see place during your lifetime. I visited Rome for the second time under different circumstances. The first visit was with my family and a tour group. Our guide made the experience very easy for us and we basically just sat back and relaxed throughout the entire experience. This time around, I was traveling with a friend on a much smaller budget. Both experiences taught me a lot and neither is better or worse. You just have to set clear expectations for a trip and what you can afford and manage with your individual restrictions. After traveling to so many European cities, I've become quite spoiled with small, more manageable sized places. Rome is certainly not one of those cities where you can walk everywhere and get somewhere within 30 minutes. Be sure to map everything out and organize your itinerary based off of location. We definitely under estimated Rome's size. This is an important topic because I'm particularly frustrated by Rome's public transportation system. Through my travels I've actually come to love public transport and found it to be much more efficient than hiring a car. The bus system is absolutely horrific in Rome. Often times buses just wouldn't arrive. I also heard from a Rome resident that when it's raining, buses often don't run their routes. I'm not sure why because in my opinion that completely defeats the point of public transport, but we definitely experienced great frustration. If you're going to brave the beast, you can purchase tickets (1.50 euro) at any sort of convenience store. More places than not will sell them. When you get onto the bus, stick the ticket into the machine and it will time stamp it. You have to hail buses, so be sure to stick your arm out if you want the bus to stop. Another important note: Terravision is an inexpensive way to get a bus transfer to the airport (5 euro each way) but you absolutely must print your ticket in advance. I purchased a ticket and didn't have access to a printer. They had my name on a list in front of me but would not let me on the bus without a physical copy. I think it's cruel and a totally ancient way of running a company (I had my e-ticket on my phone), but at least I can warn you from my mistake. If anyone is planning on going to Rome any time soon, I have an unused ticket that you're welcome to have. The bus picks up from the main train station in Rome: Termini. We stayed at a lovely little AirBnB near Vatican City. It was in a quiet neighborhood right next to S. Pietro Station. It only cost 1 euro to train from there to Termini (main station), so we were thankful for that convenience. However, getting into central Rome was a pain. If we were to do it again, I would rather stay in central Rome where there are more sights. To stay at Giulia's cozy apartment click here. Not signed up for AirBnB yet? Click here for a $40 travel credit! Colosseum: I think the outside of the Colosseum is 10x better than the inside. Unless you're super fascinated in Roman history, I recommend just skipping the ticket and taking in the beauty from the outside. Tickets are not for a set time. Just show up! To purchase tickets (12 euro) visit here. Roman Forum/Palatine: Entrance to this site was included in the price of the Colosseum ticket. 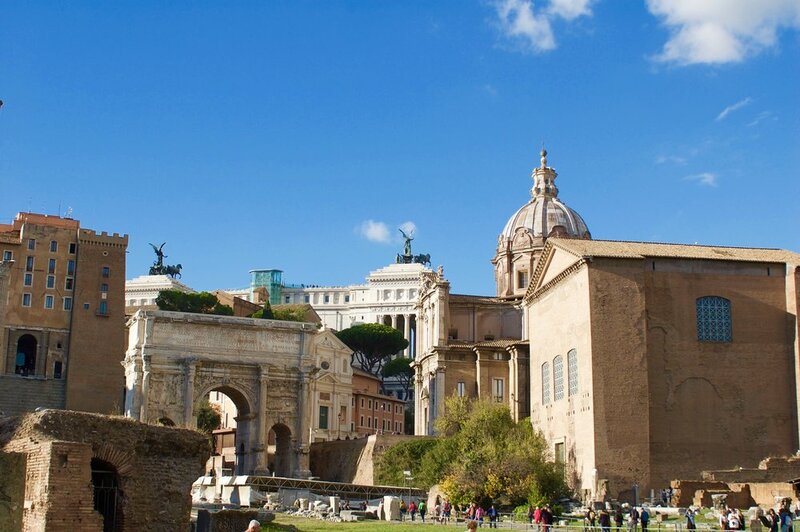 This was the center of Roman life and today an impressive amount of ruins exist. To purchase tickets visit here. Spanish Steps: Here's another spot that is best viewed at the early hours of the morning when there aren't hundreds of other people crowding the area. The Steps are also near tons of high end stores, so if you're up for a bit of shopping, head here! If you walk to the top of the Steps, there's a beautiful view of the city. Vatican Museum & Sistine Chapel: You definitely want to purchase tickets in advance and for a certain time. I recommend visiting in the morning before the museum gets too busy. Tour groups flock into the museum which makes it really hard to navigate efficiently. Student tickets are 8 euro and there's a 4 euro online/pre-booking fee. I recommend printing it out in advance. The Vatican Museum is massive and there are so many twist and turns. I think you should block out 2-3 hours to really enjoy the museum. The Sistine Chapel (located in the museum) is absolutely magnificent. You absolutely cannot take photos and will get kicked out of the museum if you are caught. To purchase tickets visit here. St. Peter's Basilica: BEWARE! Lines wrap around the entire city for this basilica. There are no reserved tickets, so get there early or prepare to wait hours upon hours. We didn't even go inside because the line was easily three hours long. Il Chianti: This was definitely my favorite restaurant in Rome. It's located just a street next to the Trevi Fountain and had a cozy feel. You absolutely must get the prosciutto and mozzarella appetizer! Gusto: Alexis and I went for apertivo here and it was amazing! Just a short walk from the Spanish Steps, you get a ton of food and a drink for just 10 euro. It has the coziest vibe and we hid out from the rain here for two hours! It almost seemed too good to be true, but they bring over three plates of food and you're welcome to grab from a whole bar of food as well. It was enough food for a whole meal, but it's worth trying this at least once while you're in Italy. It's definitely part of their culture. Cacio e Pepe: This restaurant is located in a quiet restaurant by Vatican City. The famous dish is pasta with butter sauce and pepper. It's very basic but delicious! I'm not sure it's worth going out of your way to visit this exact restaurant, but if you see this dish on a menu, give it a try! Ricami Veronica: They have these stores throughout Italian cities, but I always manage to purchase something every time I see them. The store inscribes names or phrases onto everyday items, like towels, aprons, hats, baby bibs. Last year I bought my Grandma an apron with her last name "Giorgini" inscribed on the front. My Mom loved it so much that I decided to get her a towel with her favorite saying inscribed: "Ciao Bella!" Every time we hang up the phone, she says, "Ciao Bella!" If you're walking by the shop, the owners even offer to inscribe your name on a piece of paper to show you how it will come out. 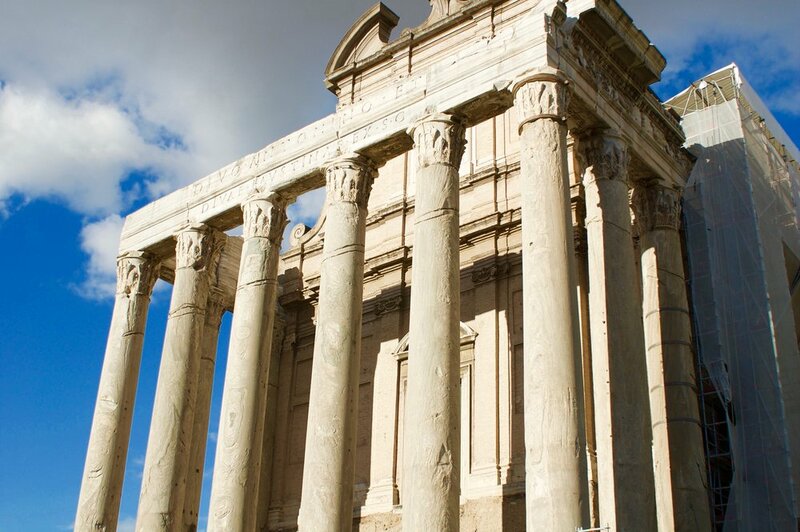 It's a sweet keepsake to have from your time in Rome.